It’s an honour to be featured on A Covent Garden Gilflurt’s Guide to Life, talking about Napoleon’s smart sister, Elisa Bonaparte Baciocchi. 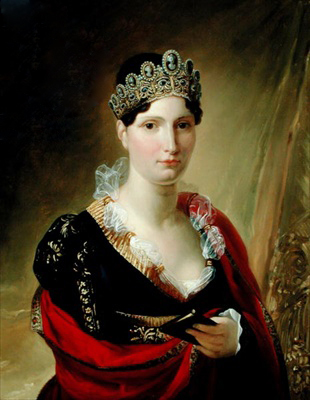 Maria Anna Bonaparte – she did not adopt the name ‘Elisa’ until she was about 18 – was born in Ajaccio, Corsica on 3 January 1777, seven and a half years after Napoleon. She was the fourth of Charles and Letizia Bonaparte’s eight surviving offspring, and their eldest daughter. To read the full post, click here. If you haven’t already visited Madame Gilflurt’s salon (“Glorious Georgian dispatches from the quill of Catherine Curzon”), I highly recommend it. A visit to Gin Lane is always enjoyable and enlightening. For links to posts about Napoleon’s other relatives, see Napoleon’s family tree. Charles J. Ingersoll, History of the Second War between the United States of America and Great Britain, Second Series, Vol. 1 (Philadelphia, 1853), p. 174. Laure Junot, Memoirs of Napoleon, his Court, and Family, Vol. 1 (New York, 1881), pp. 15-16. Elisa has the courage of an Amazon; and like me, she cannot bear to be ruled.